It’s near the beach, and rents are reasonable. A 10-suite apartment building in the Kitsilano neighbourhood of Vancouver has been put up for sale. Three Lane Manor is listed for $4.9 million. 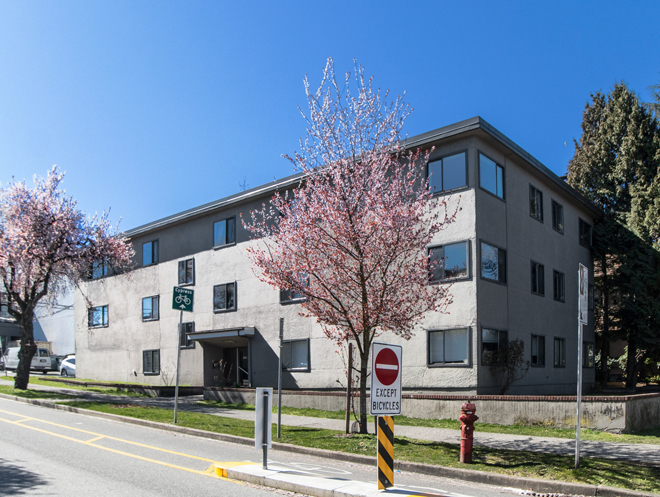 “Three Lane Manor is a well-maintained 10-suite three-storey rental apartment building located in Vancouver’s popular Kitsilano neighbourhood, close to Kits Beach, bus transportation, numerous amenities, shopping, cafes and restaurants,” according to the listing by Goodman Commercial Inc. Rents at the West Side property are lower than market rates in the Kitsilano and Point Grey area. There are six one-bedroom units at the property, with an average monthly rent of $1,043. According to rental market statistics by Canada Mortgage and Housing Corporation (CMHC), the average rent for one bedroom in Kitsilano and Point Grey is $1,442. The four two-bedroom units at Three Lane Manor have an average rent of $1,471. Based on CMHC statistics, the average rent for two-bedroom units in the neighbourhood is $2,023. The 1935 Cypress Street property is a money earner. Based on the Goodman Commercial Inc. listing, Three Lane Manor generates a net income of $103,214 per year at current rental rates. However, the listing also notes that there are opportunities to bring in more revenue as new tenants move in. “Significant rental upside on suite turnover,” the listing notes. Three Lane Manor is on the southwest corner of Cypress Street and West 3rd Avenue. It’s close to Cornwall Avenue, the “waterfront ‘main drag’ which runs parallel to the popular Kitsilano Beach coastline and offers stunning views of English Bay, the West End’s skyline and the North Shore Mountains”, according to the listing.